Being the largest suburb in Sydney’s Inner West, you can be sure there’s good reason for Marickville’s high population. Being handy to both Sydney’s CBD and the airport, it’s easy to see why this is such a desirable suburb. Like most Sydney residents, you probably live a very busy and somewhat stressful life, filled with work, various commitments, as well as family and friends. There are many tasks in life that aren’t enjoyable, but sadly unavoidable, such as washing dishes, clothes, etc. Most of us use dishwashers and washing machines to make these jobs less inconvenient. Each week you probably take your garbage bin to the curb for collection, another great convenience most of us couldn’t imagine living without. Sometimes however, dishes might be too big, clothes might need special care, and your curbside bin might not hold enough. You’ll have to work out how to clean the dishes and clothes by hand when this happens, however, you don’t have to worry about your bin not being big enough. Same-Day Rubbish Removal provides the ultimate service for when people have too much junk for their bins, or if their rubbish is too big to fit. Instead of you having to find a way to remove large items from your Marrickville home, fit them into your car or onto a ute, and take them to your nearest tip (which you’ll then have to pay a significant amount), we can do it all for you. Our service makes junk removal easy, when we come to your place, you just tell us what needs to go, and we’ll hand load all your waste into our truck. Hopefully you care about the environment as much as we do, as we’ll do everything we can to make sure that your rubbish is disposed of in the most environmentally friendly way possible. This is usually by taking it to the nearest recycling centre to have it recycled, but in some cases, we may even be able to find your old unwanted table a new home! You won’t find a better all-round service than what our friendly team has to offer. 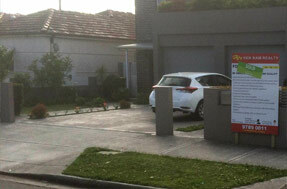 It doesn’t matter where you’re located in Sydney, we know all the shortcuts to get to your home or business fast. Our many years of experience has given us the opportunity to work on providing the most efficient waste removal service in Sydney, so not only will we be fast, but also the cheapest. We do all the work for you, you just tell us what needs to be taken away. Whether you live in Marrickville, nearby Ashfield, up in Penrith, or down in Campbelltown, our top quality service is only a phone call away. Couches, tables, fridges, washing machines, beds and mattresses are just a few of the most common items that we remove, however, there is no job too bit or too small for our team. Call us now for a free, no obligation quote and you’ll see why people love our service. Our number is 0402 737 046, we can’t wait to hear from you. Situated North of Marrickville, Petersham crosses two main roads and a railway line, making transportation, public or private, an easy task. 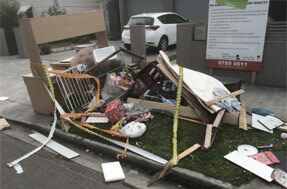 Same-Day Rubbish Removal often gets calls to Petersham properties that are in serious need of a cleanup, whether it be a deceased estate or a someone who has hoarding tendencies deciding to clean up! Whether you have a whole lot of junk like these people, or just a few items that you’re sick of holding on to, give us a call now, and we can have your Petersham home or business junk free as it should be as soon as today. Despite having a similar name to Petersham, Lewisham wasn’t named by the same person. Most people aren’t too concerned about who name a place, or why it was named that, but it is interesting to see two suburbs with similar names right next to each other. When these places were named, over two hundred years ago, rubbish as we know it today, did not exist. Sometimes we wish we could go back to those days when peoples waste wasn’t causing devastating affects on the environment, but unfortunately we have to deal with it. To reduce the affects of rubbish, our team recycle whatever we can whether we pick it up from your Lewisham address or anywhere else in Sydney. 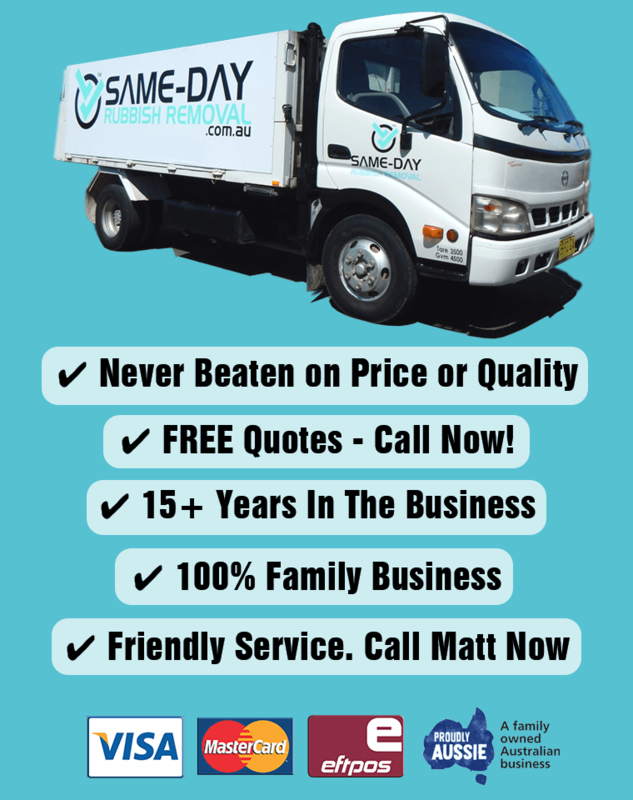 Call Same-Day Rubbish Removal now for responsible junk disposal. East of Petersham, or north east of Marrickville, lies Stanmore. Like many suburbs in Sydney, the man who named it came from Stanmore in London. Today it is home to around 8,000 people who all produce rubbish of types in their lives. If you’re one of these people, and you’ve got more junk than your usual systems can deal with, Same-Day Rubbish Removal can fix you up in no time! Give our team a call and we can come to you fast and take away whatever item/s that are bothering you. No one wants an old fridge or broken couch cluttering up the home, and most people don’t have the necessary means to remove it. We’ll make light work of it, and we won’t charge you a fortune, so call us now on 0402 737 046. West of Marrickville, Dulwich Hill takes its name from Dulwich in London, and actually has a similar population to East Dulwich! With nearly 14,000 residents, there’s always a home or business somewhere in the area that needs a junk removal service. Fortunately, Same-Day Rubbish Removal have a team nearby and ready to go, so if you’d like to get rid of your junk today, you’re in luck! The best part about our service is that we do everything we can to make sure your junk is recycled and not just sent to landfill. As we collect it and load it into our trucks, we’re able to sort it for recycling so that it can be dropped directly at the nearest recycling centre. If you’re ready to have your place cleaned up and free of rubbish, give our friendly team a call now on 0402 737 046.